Bovine Tuberculosis is prevalent in Algeria despite governmental attempts to control the disease. The objective of this study was to conduct, for the first time, molecular characterization of a population sample of Mycobacterium bovis strains isolated from slaughter cattle in Algeria. Between August and November 2007, 7250 animals were consecutively screened at the abattoirs of Algiers and Blida. In 260 animals, gross visible granulomatous lesions were detected and put into culture. Bacterial isolates were subsequently analysed by molecular methods. Altogether, 101 bacterial strains from 100 animals were subjected to molecular characterization. M. bovis was isolated from 88 animals. Other bacteria isolated included one strain of M. caprae, four Rhodococcus equi strains, three Non-tuberculous Mycobacteria (NTM) and five strains of other bacterial species. The M. bovis strains isolated showed 22 different spoligotype patterns; four of them had not been previously reported. The majority of M. bovis strains (89%) showed spoligotype patterns that were previously observed in strains from European cattle. Variable Number of Tandem Repeat (VNTR) typing supported a link between M. bovis strains from Algeria and France. One spoligotype pattern has also been shown to be frequent in M. bovis strains from Mali although the VNTR pattern of the Algerian strains differed from the Malian strains. M. bovis infections account for a high amount of granulomatous lesions detected in Algerian slaughter cattle during standard meat inspection at Algiers and Blida abattoir. Molecular typing results suggested a link between Algerian and European strains of M. bovis. Mycobacterium bovis is the causative agent of Bovine Tuberculosis (BTB) and belongs to the Mycobacterium tuberculosis Complex (MTC), a group of closely related bacteria causing tuberculosis in various mammalian hosts . BTB has a major economic impact on livestock productivity , can persist in wildlife and thus affect entire ecosystems  and it is of public health concern due to its zoonotic potential [4–6]. Although still prevalent in the developed world [7–9], BTB today mostly affects developing countries, which lack the financial and human resources to control the disease [4, 5]. BTB is also known to be prevalent in Algeria despite governmental attempts to control the disease [4, 5]. However, control is restricted to abattoir meat inspection and biannual intra-dermal tuberculin skin testing of cattle from intensive dairy farms . Moreover, the majority of Algerian cattle are not registered and cattle movement control schemes are not well established. Most of the BTB cases in Algeria are discovered during meat inspection in slaughter cattle at abattoirs when gross visible lesions typical of the disease are detected. However, in two recent studies in Chad and Uganda, Non-tuberculous Mycobacteria (NTM) were isolated from more than 40% of the animals exhibiting lesions [11, 12]. This suggests that NTM infections in cattle might be of considerable importance in some African countries. Spacer oligonucleotide typing (spoligotyping) and Variable Number of Tandem Repeat (VNTR) typing have been shown to be valuable tools for molecular epidemiology of M. bovis infections in a number of settings [7, 13–15]. Spoligotyping can be used to identify distinct groups of strains, which can often be further differentiated by VNTR typing due to the latter's higher discriminatory power . Extensive worldwide databases of spoligo- and VNTR typing patterns facilitate the comparison of results from different countries and help to elucidate the distribution and spread of strains (http://www.Mbovis.org, ). The objectives of this study were to molecularly characterize a population sample of strains of M. bovis from Algeria using spoligotyping and VNTR typing and to identify potential exchange of strains with other regions. At the abattoirs of Algiers and Blida in Algeria a consecutive case series of altogether 7250 slaughter animals was examined during standard meat inspection from August to November 2007. Lesions suggestive of BTB were sampled from 260 animals (apparent lesion prevalence: 3.6%; CI: 3.2 – 4.0%) and put into culture. Cultures from 106 animals with lesions did not show bacterial growth. Cultures from 20 animals showed contaminations and the remaining cultures from altogether 134 animals showed bacterial growth without visible contaminations. A sample of bacterial cultures from altogether 100 of these animals were further characterised by deletion-, spoligo- and VNTR typing, and sequencing of the 16S rRNA gene. Strains of M. bovis were identified by the deletion of RD4 in the genome sequence and by spoligotyping; M. bovis was detected in samples from 88 animals (table 1). In cultures of one of these animals in addition to M. bovis, a strain of Rhodococcus equi could be detected. One strain of the M. caprae clade was identified by the presence of the RD4 region and the deletion of RD12 in its genome sequence . Altogether, four animals were shown to be infected with R. equi (including the animal with the M. bovis/R. equi mixed infection). NTM infections were detected in three animals (table 1). The 16S rRNA gene sequence of one NTM strain was most similar to the 16S rRNA gene sequence of M. chitae (97.7% sequence identity); the second NTM strain was most closely related to M. brasiliensis (98.4% sequence identity) and the third NTM strain showed highest sequence similarities to M. acapulcensis and M. flavescens (99.7% sequence identity for both). However, species identification of the NTM strains by 16S rRNA sequencing did not meet the requirements reported by Bosshard et al. and may have to be considered with caution . Ureibacillus thermosphaericus and bacteria of the genus Corynebacterium, Paenibacillus, Pseudomonas and Streptococcus were each detected in samples from one animal (table 1). Spoligotyping of the 89 MTC strains isolated revealed altogether 23 different spoligotype patterns (figure 1); 18 of them had been previously reported and 5 were new, including the pattern of the M. caprae strain [18–20]. Previously unreported M. bovis spoligotype patterns were named SB1447, SB1448, SB1449 and SB1450 by http://www.Mbovis.org and the new M. caprae spoligotype pattern was named SB1451 (figure 1). The four most frequent spoligotype patterns (SB0120, SB0121, SB0134, SB0941) accounted for 40%, 22%, 7% and 7% of the M. bovis strains, respectively. Of the 22 M. bovis spoligotypes, 8 were clustered and the remaining 14 were unique patterns (allelic diversity = 0.78). Spoligotype patterns of MTC strains isolated from slaughter cattle at the abattoir of Algiers and Blida in Algeria. 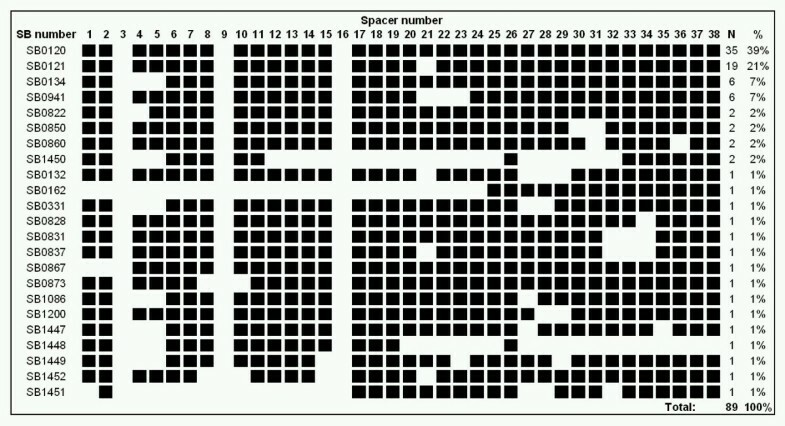 Spacers 39–43 were absent from all spoligotype patterns. SB numbers were taken from http://www.Mbovis.org. Previously unreported M. bovis spoligotype patterns were named SB1447, SB1448, SB1449 and SB1450 by http://www.Mbovis.org and the new M. caprae spoligotype pattern was named SB1451. All the MTC strains were VNTR typed using the loci ETR A-E (see Additional file 1) . For the M. bovis strains, 35 VNTR types with 16 clustered and 19 unique patterns could be identified (allelic diversity = 0.93). Spoligotyping combined with VNTR typing allowed us to distinguish 51 distinct types of M. bovis strains with 11 of them being clustered (allelic diversity = 0.95). The VNTR patterns of the four most common spoligotypes (SB0120, SB0121, SB0134 and SB0941) are shown in table 2. Spoligo- and VNTR types of all the 89 MTC strains are summarised in Additional file 1. It is noteworthy that the frequency of the various M. bovis genotypes detected did not markedly differ between the two study locations Algiers and Blida. To our knowledge, this is the first study conducting the molecular characterization of strains of M. bovis isolated from slaughter cattle in Algeria. However, routine abattoir meat inspection and periodic intra-dermal tuberculin skin testing of cattle from intensive dairy farms have already previously revealed the presence of BTB in Algeria [4, 5]. In our study, MTC infections were detected in 89/7250 animals (1% of all sampled animals). Considering the imperfect sensitivity of meat inspection and culture and the fact that only 100 of the 134 positive cultures have been characterized, the true prevalence of MTC infections in the sampled cattle population in fact may has been considerably higher. Ayele et al. previously reported a low sporadic incidence of BTB in Algeria ; therefore, our results indicate a more frequent occurrence of M. bovis infections in Algerian cattle than previously suspected. Unlike reported for Chad and Uganda, where NTM strains were isolated from more than 40% of the animals with lesions [11, 12], only 3 of 100 Algerian cattle showed NTM infections. R. equi, which was detected in samples of 4 animals, has so far not been reported in connection with cattle infections in Africa. Taken together, these results suggest that there may be a difference in the bacterial species causing pulmonary infection and lesion formation in cattle between Algeria and some countries of sub-Saharan Africa. The calculated allelic diversity of spoligotype patterns among the M. bovis strains isolated in Algeria (0.78) was relatively low compared to France (0.91) but similar to strain diversities reported from the UK (0.79) and many other places in the world [1, 7, 13, 22]. However, considering the fact that the sample of M. bovis genotypes characterized in our study may not be representative of the country wide population of M. bovis, the calculated allelic diversity should be considered with care. Of the 22 M. bovis spoligotype patterns detected, 13 patterns, accounting for 89% of all the strains isolated, have previously been detected in strains isolated from French cattle . The three spoligotype patterns most frequently detected in strains from Algeria (SB0120, SB0121, SB0134) are also the three most frequent types observed in France  and are also known to be common in strains from other continental European countries [8, 23–25]. Live animal importation from Europe to Algeria is documented. It presumably started during the French colonial period (1830–1962), has continued up to the present time and has mainly aimed at increasing the Algerian population of highly productive dairy cattle. Therefore, the observed similarity of spoligotypes may reflect the introduction of M. bovis from mainland Europe to Algeria. Interestingly, in a previous study we have identified strains of spoligotype pattern SB0134 (figure 1) as highly prevalent in cattle from neighbouring Mali . Strains of that spoligotype pattern are also the third most frequent strains detected in France. VNTR typing results for loci ETR A-E were available for strains from Algeria and Mali but no matches were found (table 3). ETR A-D patterns for strains with spoligotype pattern SB0134 from the Normandy region in France have previously been published . Pattern 7 4 5 4 for loci ETR A-D was detected in strains from France and Algeria and pattern 6 5 5 4 for loci ETR A-D was present in France and Mali (table 3). We obtained VNTR patterns of M. bovis strains isolated in France with spoligotype pattern SB0120 (M. Boschiroli, unpublished data) and found matching ETR A-D patterns for 10/19 Algerian M. bovis strains with spoligotype pattern SB0120 (data not shown). Results from Mali and France have previously been published [26, 27]. § Matching patterns of strains from Algeria and France. £ Matching patterns of strains from Mali and France. The presence of a 24 bp deletion in one of the repeats of ETR D (in our analysis marked with *) was not declared in the French study. Due to the small sample size in the studies in Mali and Algeria and the sampling at only two abattoirs in northern Algeria and one abattoir in Mali, we cannot infer the absence of strain exchange between Algeria and neighbouring Mali. However, our data indicates that some strains of M. bovis found in Algeria and Mali may have been independently introduced from France (or more generally continental Europe). Live animal importation from Europe into Algeria is continuing up to date. However, nowadays, a negative tuberculin skin testing result must be certified before importation. During the colonial period, import restrictions may have been less rigorous for cattle imported from France. Also, the increased efforts to control BTB in Europe during the second half of the 20th century have lead to a decreased prevalence of the disease in cattle of many European countries . Therefore, supposedly, introduction of strains of M. bovis into Algeria could have most likely occurred during the colonial time. However, occasional importation of diseased but undetected live cattle might still be possible. Introduction of M. bovis from Europe into other countries has been suggested several times [7, 13, 29–31] and further investigations on the relationship between European strains and strains from other parts of the world might be worthwhile in order to elucidate the global spread of M. bovis. Due to the small sample size, the limited survey period and the sampling at only two abattoirs in northern Algeria, the population sample of M. bovis strains collected may not reflect the country-wide bacterial population structure. Therefore, frequencies of strains with a specific spoligotype do not necessarily mirror the actual frequency of these strains in the population. Moreover, it is possible that animals from some regions have been overrepresented in our sample. The origin of the animals could not be traced due to poor documentation and multiple selling-on of the animals prior to slaughter. However, we assume that the majority of animals were dairy cattle and that only few animals originated from the same herds. Due to the characteristics of the local livestock production system we further assume that the animals originated from a large area of northern Algeria with a majority of them presumably coming from the central northern part. Indeed there was evidence that some of the cattle slaughtered at the abattoir of Algiers originated from an approximately 300 km distant region around Sétif. The implementation of a tracing system for animals would be of great value to further enhance BTB surveillance through abattoir meat inspection or molecular epidemiological studies. A tracing system could possibly also help in the early detection of BTB outbreaks and their localization. This study presents the first molecular characterisation of a population sample of strains of M. bovis isolated from Algerian cattle. BTB accounted for a high amount of granulomatous lesions detected in Algerian slaughter cattle during standard meat inspection at Algiers and Blida abattoir. Spoligotyping as well as VNTR typing results suggest a close link between the strains isolated from Algerian cattle and M. bovis strains from mainland Europe. This study highlights the importance of both spoligotype and VNTR typing databases and standardised protocols to assist global molecular epidemiological investigations of M. bovis infections. Samples were collected between August and November 2007 from a sequential series of slaughter cattle at two abattoirs in Algeria (in Algiers and Blida), approximately 50 km apart from each other. The cattle population consisted mainly of young males and old cows with males being significantly more often slaughtered at the abattoir of Algiers and cows more often slaughtered at the abattoir of Blida. Of altogether 7250 animals examined, 93% of the cattle were exotic breeds (Holstein and Montbelliard), 6% were cross-breeds and only 1% local breeds. Altogether, 4980 animals (69%) were males and 2270 (31%) were females. The origin of the cattle could not be traced due to poor documentation. We assume that the majority of animals were dairy cattle and only few animals from the same herds. The animals encountered at Algiers and Blida abattoir possibly originated from a large area of northern Algeria with a majority of them presumably coming from the central northern part. Tissue samples of 260 animals with gross visible lesions were collected. The samples were transported on ice to the Institut Pasteur d'Alger for further processing. At Institut Pasteur, Algiers, specimens from all 260 animals, which exhibited gross visible lesions, were dissected and manually homogenised using a mortar. Samples were decontaminated by addition of 4 ml of 4% H2SO4 and neutralised with 6% NaOH using bromothymol blue as an indicator for the pH. Two Löwenstein-Jensen slants, supplemented with either sodium pyruvate or glycerol, were inoculated with 3 ml of the suspension and incubated at 37°C until bacterial growth was visible or for at least 12 weeks. Presence of Acid-Fast Bacilli was tested by Ziehl-Neelsen staining and microscopy. Cultures from 106 animals did not show bacterial growth. Cultures from 20 animals showed contaminations and the remaining cultures from altogether 134 animals showed bacterial growth without visible contaminations. A sub-sample of 101 bacterial cultures from 100 animals was sent to the National Reference Centre for Mycobacteria in Zurich, Switzerland. DNA of all cultures was extracted using the InstGene™ Matrix (Bio-Rad®). Spoligotyping was conducted at the Veterinary Laboratories Agency in Weybridge, UK as previously described . VNTR typing was carried out as previously described using primers targeting the loci ETR A, ETR B, ETR C, ETR D and ETR E according to protocols of Frothingham et al. . The ETR-D locus contains a 24 bp deletion in one of the repeats and the naming convention indicates the presence of this deletion by a * i.e. 4* (= 3 × 77 bp repeats and one 53 bp repeat) . Allelic diversity was calculated according to the method of Selander et al. . Strains were identified as M. bovis by the absence of the region RD4 and as M. caprae by the absence of RD12 and presence of RD4 as described by Brosch et al. . The 16S rRNA gene amplification and sequencing was carried out as described by Zucol et al. . Species identification was carried out by comparison with the sequences of the SmartGene Integrated Database Network System (IDNS™) 3.4.0. Criteria for species identification were taken from Bosshard et al. .
Naima Sahraoui, Borna Müller contributed equally to this work. We would like to thank Prof. Erik C. Böttger and the technicians of the Swiss National Centre for Mycobacteria in Zurich for assistance and laboratory facilities. We would also like to thank Prof. R. Glyn Hewinson from the Veterinary Laboratories Agency in Weybridge, UK for providing technical support and laboratory facilities for spoligotyping and VNTR typing. Dr. Maria L. Boschiroli has kindly provided us with preliminary VNTR typing data of M. bovis strains isolated from French cattle. Our work has received financial support from the Swiss National Science Foundation (project no. 107559) and the Wellcome Trust Livestock for Life initiative. NS conception and design of the study, sampling of animals, culturing of Mycobacteria, VNTR typing. BM principal supervision of molecular typing, and molecular analysis of bacterial strains, writing of the manuscript. DG supervision of the project and main supervision of NS. FB supervision of laboratory work and cultures at Institut Pasteur, Algiers. DY supervision of laboratory work and cultures at Institut Pasteur, Algiers. RO fieldwork and sample collection. SB contribution in paper writing and support for molecular typing NHS contribution in analysis of the data, important intellectual contribution for population genetical analysis. JZ supervision of the project, acquisition of parts of the funds, important intellectual contributions. All authors read and approved the final manuscript.